His footsteps rumbling across the cabin floor above us echoed like the thunder of a shotgun. The old board floors creaked under the paws of this hungry giant. This would be the last time I would ever listen to Randy. Just because Randy was afraid of bears, we ended up hiding in the cellar, locked in a dark dungeon under a trap door that wouldn’t budge. It was damp down there, but as uncomfortable as we were, we tried our best to be as quiet as possible. Given the fact that the place was crawling with rats, the urge to scream became unbearable. The old bear was probably only looking for something to eat, but that didn’t matter. Truth was, we were defenseless down there, and if the near rotten floor boards didn’t hold up, it would just be a matter of time before the giant animal ended up down in the cellar with us, and that wouldn’t be good. There were other places to hide, such as the attic, where there was a door that led to the roof and to safety; but given the fact that my younger cousin climbed into the dark hole under the stairs and started screaming, I had no choice but to follow him. The bear continued his search for food, and he found it. We both shivered when we heard him tear away what was left of the cabinet where we kept our food.In just a few minutes, he would leave the cabin, or what was left of it. Once he was gone, I had Randy stand on my shoulders, and with all my might, and the adrenalin that was bursting to leave my body, we managed to push the heavy door open and escape. We waited a while before venturing out the door. In the distance I watched the brown bear disappear from view, giving us time to run out the cabin and into the truck. This is my first entry into this week’s Trifecta Challenge. My 9 year old woke me up at 6 a.m. this morning. He had to tell me that since the bus was coming an extra ten minutes late, he could sleep ten more minutes past his wake up time of 7 a.m.
“Doesn’t that mean that you woke up an hour early to tell me that you could have ten minutes extra sleep?” I asked, in a very sleepy manner. “Ya, I woke up early to tell you that. Now I am going back to sleep. See you at 7:10” he said. I couldn’t sleep afterwards. Sigh. 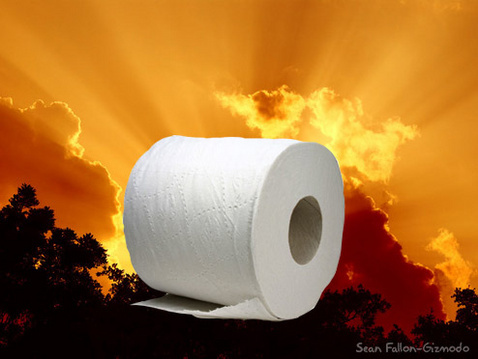 Always keep at least one roll of toilet tissue in the car. Words to live by, learned the hard way. It was an intensely hot day in July of ’02 when I ventured to the local camping park to meet with my friends. I didn’t bring anything to drink, and since my little Hyundai Accent was without air conditioning or roll down windows (the windows worked once, but that option did not last long on this little tin can of a car) and by the time I reached the park, I was parched. There was nobody around, and I spotted a 2 liter bottle of Diet Pepsi sitting innocently on the camp table next to my buddy’s tent. Closer inspection showed that the bottle was not yet opened, but very hot. I was so thirsty, I opened the bottle and took a long drink. Warm Pepsi on a hot day is not a great idea, but without anything else around, I had to drink something, and what harm could it actually do anyway? I found out the answer to this question some two miles from the park. My stomach felt like someone kicked the guts out of me, so I pulled over and went to the trunk to get a roll of toilet paper. Damn, I cleaned out the car on Friday, and I must have forgot to replenish my emergency supply of TP. Oh well, I really didn’t like the T-shirt I was wearing anyway. I discovered the link between hot Pepsi and Diarrhea, and my poor T-Shirt was no more. I was fortunate that the ditch had a few long leafy trees, which provided great cover and an even better outhouse for my desperate situation. With great relief (and no shirt), I climbed back into my little sauna of a car, and I headed home. I was doing pretty good when the next cramp hit me. Again, I pulled over on the highway, this time on a fairly small shoulder of the road, and in a desperate situation, ran to crouch behind a few alder bushes. This time I sacrificed the shorts I had been wearing. They were of the Boxer variety, and despite being fairly comfortable, they were not the best replacement for toilet tissue. I glanced around and when the traffic disappeared, I made a vigorous run for the car…wearing only my underwear and socks. By now, I was in a desperate hurry to get home. I maneuvered the little Hyundai through any cars or trucks that were ahead of me, and figured that I would be okay when a cramp so painful that it almost caused me to lose control of the car hit me, I had no choice but to pull over one more time. This time, the shoulders of the road were bare, and there wasn’t even so much as a bush on either side of the road. Since the pain was just unbearable, I had no choice but to crouch down on the side of the road and deal with it. Wouldn’t you know it, the biggest line of traffic I had ever witnessed (all the cars I had passed earlier) drove right past me. There I was, sitting in the ditch, dressed in only a pair of briefs (which were pulled all the way down to my ankles) and black socks, red in the face from a combination of pain and embarrassment, and a decision to what the next piece of clothing I would discard in the ditch would be. It was the underwear and socks. I found an old garbage bag blowing next to me, and used this to line my seat. I sat on the bag, started the little car, and took off down the highway. I was about five miles from home, cruising at 140 or so Km/h, with a big smile on my face. Another pain hit me, but I decided to push the car even more and attempt to make it all the way home, to my own toilet, where toilet paper was in abundance, and so was my clothes closet. I was in such pain that my finger prints were permanently imbedded in the steering wheel, but I was laughing loudly because at this rate, nothing in the world would be as bad as the pain and embarrassment I suffered today. Nothing except for the next thing to happen to me. 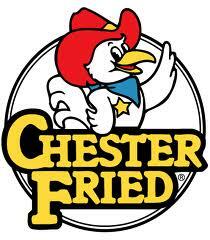 I was cruising at speeds not yet heard of in a Hyundai Accent when I noticed a red and blue flashing light behind me. A COP. At first I thought about continuing on my way home, but the thought of being arrested and stuck in a jail cell naked was not what I had planned for the evening, so I pulled over. The cop, rather surprised at my lack of attire, asked me to step out of the car. What a joker, thinking I was going to get out of the car naked. I pleaded with him that I really needed to use the bathroom, and if he didn’t let me go, I would go right in front of him, on the garbage bag under me. A combination of pity, heat and the smell must have clouded his judgement, as he told me to head for home, but to cut my speed to that of the speed limit. Without hesitation, I took off, tires squealing and dirt flying from my tires. I made it home, did what I needed to do, and filled the entire trunk area of the little car with toilet paper. Every vehicle I have owned from that moment on always has a good supply of toilet paper. Lesson learned! I was fifteen or so at the time, and thought I knew it all. What teenager doesn’t? What made this adventure different was the lesson at the end. The day was a wet one, three days of hard rain will do that sometimes. The tree branches were drenched with cool water, and the gentle breeze awarded a misty shower. The snow was almost gone from sight, except for the small patches of the cold stuff that lingered in the low lying valleys and ditches. I took out my trusty three speed, and without packing a lunch, I bravely (or stupidly) took off on a spring adventure. The road out of the community led to a road called Igloo Road. Back in the late fifties, the Ernest Harmon Air force Base was in full swing in our town, and the army created underground bunkers to store stuff. Stuff was what my dad said was stored in those buildings which were built of concrete with grass for a roof. 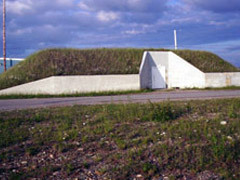 Anyway, the underground bunkers, which were referred to as ‘Igloos’ lined either side of a dirt road directly across from the tiny community in which I lived. It was always an adventure riding on Igloo Road. You never knew what you would find in the areas around the igloos. In the early seventies, the town stored many items in the igloos, and from time to time, someone ventured inside those dark cave-like hideaways and threw out good stuff. My friends and I made trips to the igloos in search of hidden treasure on many occasions. I once found an old kaleidoscope that I treasured for many years, and wish I still had. Me and Ricky went to the igloos once, and we found a naked couple sunbathing right there on the ground, even with snow patches everywhere. We had a laugh throwing icy cold snowballs at the naked couple, who quickly gathered their belongings, cussed at us, and exited the scene. This day was quite different than the time me and Ricky ventured to the igloos. On this day, I would carelessly go to the igloos on my own. I didn’t even tell mom or dad I was going. I was excited to get the best treasure for myself, so I anxiously paddled to the site. There was a large box near the entrance of the door, which was left open. The box was empty, its contents strewn from the box to deep inside the igloo. Foolishly, I followed the litter until I was inside the igloo, when suddenly the wind blew the solid steel door shut. I was in complete blackness, locked in a cement dungeon, alone and afraid. It was so dark that I had no idea where the door was, where the walls were, or what lie in front of me. I stumbled across the floor, tripping over a long object wrapped in a carpet like covering. Crawling to recover my footing, I thought I felt an arm on the floor next to the object, and feeling my hand along the side of the object, I know I felt hair and a head. I screamed, but my scream went nowhere. I was trapped with a dead body, in complete darkness. In my horror, I heard a squeal from behind me, as a large rat (at least I thought it was a rat, God only knows what it was in this darkness) brushed along my arm, sending goosebumps up my spine. I was in hell. I remember crawling and feeling along the floor for a rock or a brick. I was a bit hesitant to move, fearing the chance of finding yet another dead body; God knows, one dead body in a dark, spooky cave is enough. I climbed up to damp wall, feeling the moisture and maybe even mildew with my hands, and my touch led me to a person standing next to me. Horrified, I tried talking to him, but no response. I leaned to touch the person, and he and I fell to the ground. I was so scared, I began crying out. During my descent to the ground, I happened along a brick like object, and using the brick, I pounded on the walls, making my way through the darkness until I found the steel door that had trapped me in this dark grave. I pounded on the door, in a pattern that my dad taught me. Bang Bang Bang (quickly) Bang Bang Bang (Slowly) and then Bang Bang Bang (quickly again) in an SOS pattern. I must have been doing this for quite some time because I still remember the pain in my arms from doing so. In what seemed like an eternity, I thought I heard something outside. I hollered and cried and continued banging on the door, and all at once, my dark grave opened to a sunny day. The cool rays from the sun illuminated a dusty trail in the air, and my lungs breathed the clean air. I fell to my knees as I noticed my dad standing at the door, pipe wrench in his hand, with a look of worry I have not seen in some thirty or more years later. “We were so worried when you didn’t make it home for supper.” he said, in a tone that was both worried, relieved and severely pissed off. “I asked Ricky where he thought you might be, and he directed me right here” he said. I didn’t care if he would ground me until I was fifty, I was just glad to get out of the dark hell of an igloo. Peering into my captor, I spied the bodies that lay on the floor and stood against the wall. Apparently a clothing store must have been storing their supplies in the igloo, and the dead bodies I thought I found were nothing but lifeless mannequins. Thank heavens for that one. I was, however, right about the rat. The place was crawling with them. I sure learned a valuable lesson that day. Never go anywhere without telling anyone where you are, and always have a friend come along…and never, never go inside one of those dark igloos for any reason. The rest of my summer was spent near the house, grounded…with a fear of dark places that would last another five years, and don’t even mention the word ‘Mannequin’, I still fear those things. The clouds looked like they had something angry to say. Does anyone have a bit of sunshine we can borrow? Back when I was a kid, I loved spring time. At school we had our marble competitions, and at home, my dad was busy cutting alder branches to make his home made whistles. “You have to wait for the sap to run before you can make a good whistle” Dad would say, as he crafted those little whistles.I had whistles of every note, and although tone deaf, I managed to play a few tunes all on my own. My dad was a natural musician; he taught himself to play guitar from listening to country songs on the radio, and he taught himself to play the whistle from a skill handed down from his grandfather. I remember him holding five whistles, and together, he played a serenade of beautiful music. It is terrible how skills like this are lost through the ages, whistle making used to be something that fathers passed to their kids; nowadays not many have this talent. Dad would take an alder, which is a birch-like tree that grows abundantly here on the island, and bend it to his ear. He would then tap the alder to see whether it was sound. I am not sure whether this made any difference to the finished product, he always said that it did. The next step, he would cut a six or eight inch length from the alder, always using the newest branches, and he would cut each end square. Once he had the branch cut, he would hold the blade of a pocketknife and using the handle, he would tap along the ends of the alder, loosening the bark. He would then score a line two inches from each end, moisten the bark in his mouth,and magically, the bark would slide right off. “You have to be careful not to tear the bark, as this will be needed later” he would say, as he continued with his musical craft. Then my dad would whittle a small slice into each end of the alder stick, “The deeper the hole the deeper the note” he would instruct. Once this was done, he would slide the bark back over the end of the stick, to see if it fit properly. Removing the bark one final time, he carefully cut a long slice away from the stick, from one end to the edge of the wedge, and then he would replace the bark.From time to time, he made a whistle on each end of the stick, each of a different note. Magically, he transformed a short piece of alder stick into a whistle. He then played a jig on the two sided whistle that he had made. My dad loved making those whistles almost as much as we kids did playing them. My son was up at my dad’s the other day; he was sitting next to my dad, almost hypnotized as dad carefully crafted a whistle for him, just like he did for me, all those years ago. This weekend, I will try to make my first whistle for my son. Hopefully he will pass this skill on to his son someday. We were just kids back then, and everything seemed like a good idea. That is when my little brother gave me his nod of confidence, and off we went down the steep gravel hill. He on the handlebars of my old banana bike, and me paddling like a bat outta hell. We were doing great at first, but our success didn’t last long. The front tire of my bike hit a sharp rock and just like that, my brother seemed to vanish into thin air. He didn’t exactly vanish, that would have been too painless a result. What he did do was fly off his perch, and land head first on a large rock. Alarmed and worried at the same time, I rushed to the aid of my brother, who was seven years younger than I. I was supposed to be taking care of him, and I almost got him killed. I paid no attention to the possibility of my mom actually killing me when she found out what happened, instead I hurried to the rescue of my little brother, who was lying unconscious on the ground before me. I held him in my arms, crying out loudly. A large blue bump began to form on his forehead, and blood streamed from a large cut on his arm. In all my fourteen years on this earth, I did not think for once that I could do anything so stupid, but then again, I was young, and good decisions were not usually among my strong points back then. As I cried out, my brother came to, telling me to keep the noise down. He said that his head was paining, and all my crying was making it worse. I carried the little guy all the way back to the campsite where my parents were, praying that he was okay. He was lucky, as the doctor said the injuries were minor. My punishment however, was not minor. Grounded for the rest of the summer. as do the boys’ cap guns and marbles. I wonder what criminal past this moose has. Could it be that he was the one responsible for the break in at the local gas station? Who would notice a 1500 lb deer fleeing the scene? Maybe he was the peeping tom (or Bullwinkle) that was recently reported in the Conception Bay area. 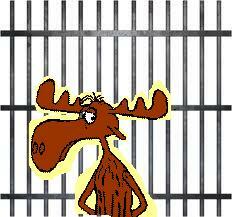 You gotta watch out for those moose, especially those who are fugitives from the law. I wonder if the moose put up much of a fight; if so, the poor creature could have also been charged with resisting arrest. I will gladly take the funny news stories and the low crime rates of the province (despite any funny stories or Newfie Jokes that may come from stories such as this) instead of the murders and muggings that take place in other major centers throughout the world.